Who wouldn’t want to experience that? In my research of Denmark, I came across a book that mentioned how Danish leave their babies bundled up, in strollers, outside, in the winter, UNATTENDED, while the parents go into a restaurant or cafe to eat. It was hard to believe. Who does that?! It’s true, and I saw it first hand. Can we take a moment to think about what this says about the Danish culture? How beautiful is it that people feel their babies are safe and they can leave them unattended? And, it’s not like the parents are sitting right inside with a window for viewing the babies. There are no cameras outside recording footage that is being featured on a Jumbotron in the restaurant. No, these parents are relaxing. Why do parents in Denmark leave their babies unattended outside? I believe the happiness plays a key part. People are happy. People aren’t kidnapping babies. Where Was My Adventurous Spirit When Grocery Shopping in Denmark? Questions to ask a hospital on a hospital birth tour. No. I’m not currently pregnant. But, as I wrote in a post recently that talked about all about breastfeeding, I’m sharing some other posts from my old Green Mommy Blog. This is another one… taking a tour of a hospital even though I originally had planned a home birth for my daughter. Well. As some of you know, I did end up in the hospital for the delivery of Kamea, but it wasn’t the local one I toured. Kristen Suzanne: A Future Mom Now A Reality! Is It Safe To Drink Green Juice While Pregnant? A Reader’s Question. Great question! For starters, you know I’m not a doctor or midwife. I’m a chef who reads a lot – lol – and has a passion for nutrition and health. That being written, here is how I handled the situation when I was pregnant. There is indeed a risk of contamination when consuming raw foods while pregnant (well, anytime really, but for pregnancy it has its own dangerous implications). However, I wasn’t about to give up my raw foods. Therefore, while I was pregnant, I did not consume any fresh juices unless I made them myself (except on perhaps three or four different occasions while traveling). It wasn’t worth the risk in my opinion. In fact, even making them myself was not risk-free, but I believe it was greatly reduced because I thoroughly washed and scrubbed my ORGANIC produce. To wash them, I often used food grade hydrogen peroxide (this is the not the stuff you buy in the drugstore). The same rules applied for salads and other fresh foods that I didn’t prepare. I had them on occasion at a restaurant, but I knew the possible risk of doing it, so I didn’t do it often. And, for the times I did do it, they were usually vegan or raw places that didn’t serve meat products which is helpful (exception – the veg burritos with fresh salsa and guacamole from Chipotle – lol – I had those a few times). Overall, my pregnancy was mostly high raw with some times that were all raw and some times that were moderately raw. I stayed away from green powders because they (at the time) had an ingredient or two that just didn’t seem good to me in a pregnant state after researching all the ingredients. That being said, I have read about a number of women drinking green powders while pregnant. If I were to become pregnant again, I would probably consume Greener Grasses because that is a powder that seems both nourishing and gentle (I am drinking this now while breastfeeding and it’s wonderful). Again though, this is just how I would do it. There are many others who might differ in their successful and healthy pregnant experiences. I received the following on one of my posts about pregnancy but thought I’d also include the information here. I’m newly preggo for the second time (first time being 4 years ago). My diet and knowledge have changed a lot since. I’ve been researching your blog and have a couple of questions. First what prenatal vit did you end up liking the best? Why did you stop taking vitamineral green and fruits powders while you were pregnant? And, just out of curiosity, why do you use both hemp powder AND seeds in your smoothies and not flax? Love your blog, you rock. 3) Hemp has a more ideal ratio of omegas than flax (read more about this here). I also like the higher protein in it which is why sometimes I used both hemp powder and hemp seeds. 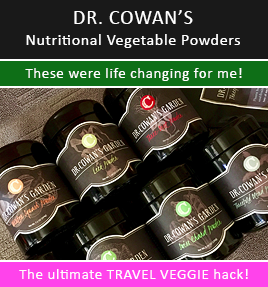 Kristen’s Raw 15th Awesome Giveaway – FREE RAW VEGAN VITAMINS! Go Raw’s Ginger Snaps Cookies (maybe 1/2 the bag?) Mmmmm!!!!!!! If I’m still hungry? Then a Cherry Chocolate Bomb Shake! I walked on Monday and will also get in my 2 mile walk Tuesday, too. (Happy mama at almost 6 months) This week we had our monthly visit with our amazing midwife, Shell (see why we are choosing a midwife / homebirth here). Everything is going wonderfully. My weight gain is healthy (weighed in around 145 today), my urine analysis is pristine, my blood pressure is low and healthy, and overall, I feel great. Shell mentioned that I don’t seem to have some of the issues many pregnant women seem to experience (swollen extremities for example). I attribute it to my healthy lifestyle. She also gave me some magic pregnancy tea. I call it magic because anything this woman makes or does is magical for my baby. She’s just so awesome. My instructions are to drink a quart a day. Yum! I can’t wait! After our appointment, we went to one of my favorite places for lunch, Chakra 4 Herbs. 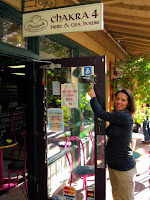 They are organic and have many raw and vegan dishes. I always get a bowl of their (cooked) soup because it’s the best soup in the whole world. Truly. And, then I usually get one of their giant organic wraps that is stuffed with greens, veggies, olives, and raw vegan cheese. On our way out I noticed they had a “breastfeeding friendly” sticker on the door so I had to take a picture of it. They rock!